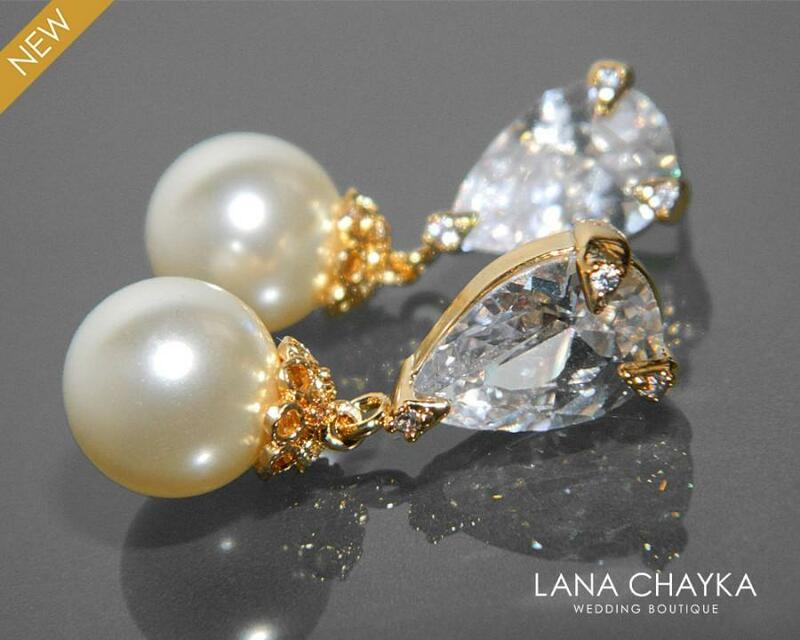 Swarovski 10mm Cream Ivory Colored Drop Pearl Cubic Zirconia Gold Bridal Earrings. EARRINGS are about 1 inch ( 2.8 cm ) long from top of ear stud to bottom. MATCHING NECKLACE: https://www.etsy.com/listing/204349216/wedding-ivory-pearl-necklace-single-drop?show_sold_out_detail=1 These earrings are made with Swarovski 10mm Cream Ivory color round crystal pearls, Gold plated Cubic Zirconia earring studs with 925 Sterling Silver earring posts, nickel free, and Vermeil Gold filigree components encrusted with clear Cubic Zirconia stones.